Modern Improv Round Robin – WiP Progress! I started out by completing the second column of improv blocks. Once they were done I had to decide what to do next. It didn’t take long for me to quickly settle on a bit of dark sashing instead of continuing to create these blocks. I am pleased with the way they frame the blocks but I also like the fact that it isn’t completely set by borders. 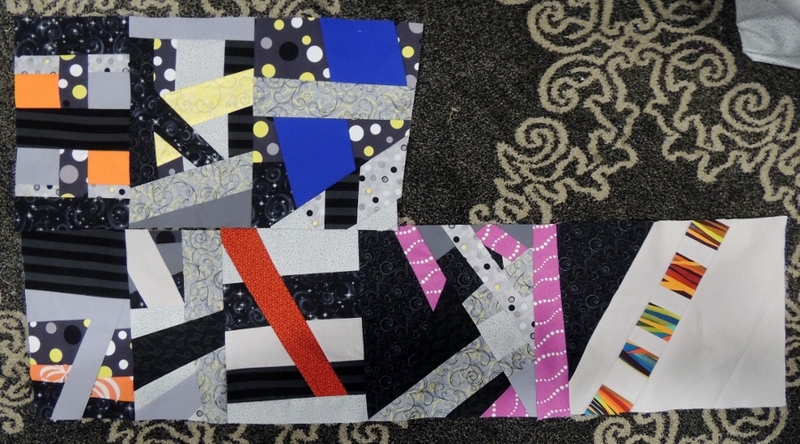 I know that I also want an eye popper for my binding, so I selected the keystone fabric that I used during the class for the border, which is the yellow fabric with light grey and white swirls that is in the middle of the right hand column. Given that I was using yellow for the border, I selected a few fabrics for the backing and put one together rather quickly using left over materials. Again, I think the pop of yellow for the border will look nice. I am excited by the progress and just need to find some batting and a bit of time to get this WiP completed! Those look like fun blocks to make! They were fun… but the amount of fabric that was thrown away was stunning. The class itself was neat to take because everyone had a different way of starting out their block that lead to wildly different improvisations, so it was neat to be able to experience and see all the variations.